Chocolate mousse (mousse au chocolat) is the type of dessert that is simple to make, that will bring sweet happiness to all and that will most definitely satisfy your chocolate cravings. No baking is required and although you will need to plan for several hours of refrigeration so your mousse au chocolat can “get ready”, it only takes about 10 minutes to prepare. Chocolate mousse is a versatile dessert which you can take on the road for a picnic or add to your 5-course menu with shavings of chocolate on top for an unpretentious touch of sophistication — si bon! It’s hard to mess up a chocolate mousse but still, there are a few tips that you can follow to make sure your chocolate mousse turns out just right. 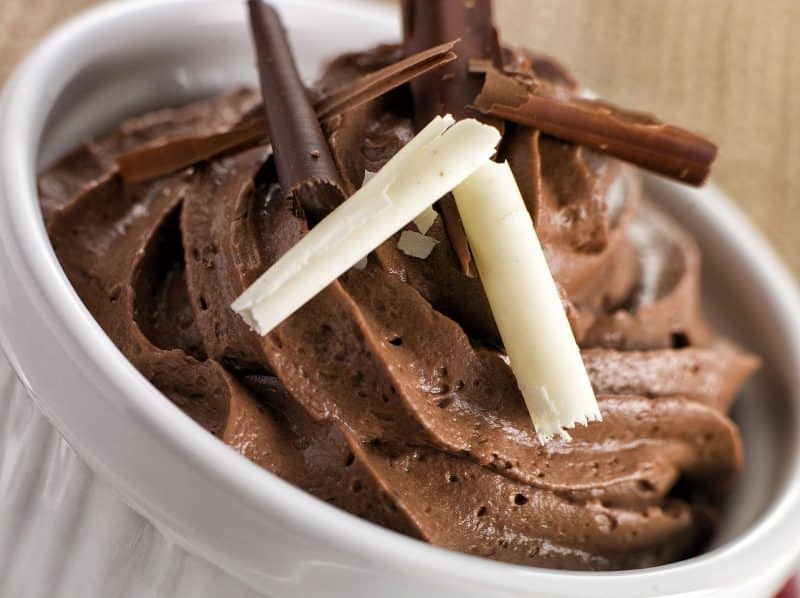 So check below for 4 tips on how to make the perfect chocolate mousse – light and airy! Make sure yours eggs are at room temperature: take the eggs out of the fridge at least 30 minutes before using them. Remember, before fridges became so widely used, eggs were not stored in the fridge – that is one of grandmothers’ best baking secrets (secrets de grand-mères)! Cold eggs will harden the melted chocolate changing the texture of your chocolate mousse. This is not an issue in France since we get our eggs from trusted local farmers (and even when we buy eggs at the store, eggs are typically sold in the non-refrigerated section of French supermarkets). In the US however, we do need to remember to take eggs out of the fridge when making desserts. It is important to keep “the cold chain” (la chaîne du froid) from breaking when storing food and since eggs are always sold in the refrigerated section of supermarkets in this side of the Atlantic, we store our eggs in the fridge in the US so a bit of planning is required when making desserts (this tip applies to all desserts by the way). But if you forgot to take your eggs out, don’t let this stop you from making your chocolate mousse simply try to give them as much “room temperature” as you can. Extra Firm Egg Whites: the key is to beat your eggs very firm – add a pinch of salt to help the process along. 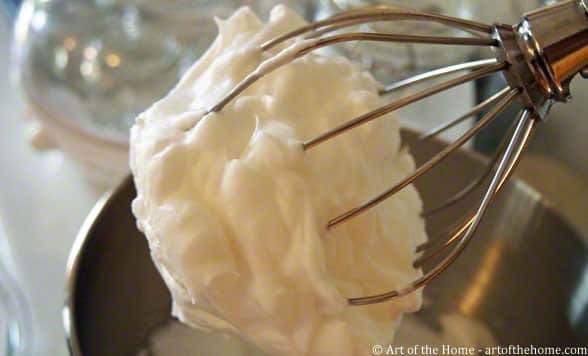 The extra firmness of your egg whites is very important because the beaten egg whites is what will give your mousse that light and fluffy texture. The test is that you should be able to turn your mixing bowl upside down without the whites falling down (that’s a grandma’s saying) but no need to try this at home, this is for illustrative purposes! As long as your egg whites grab firmly to the whisk, it’s firm enough! Carefully Folding Egg Whites: incorporate the egg whites very delicately and in batches. Typically,we do three batches: start with about 1/3, then another 1/3 and fold in what’s left. And never mix but fold your beaten egg whites without forgetting to gather the chocolate at the bottom of the bowl. Choose a high quality chocolate: any recipe will turn out better with high quality ingredients but with a chocolate mousse, chocolate is the star of the show so it is important to choose a top quality baking chocolate. This being said, we have made a quick chocolate mousse with leftover chocolate chips – children love it! So how about treating your loved ones and yourself to the highly rated Art of the Home Chocolate Mousse (Mousse au Chocolat) for dessert some time this week?